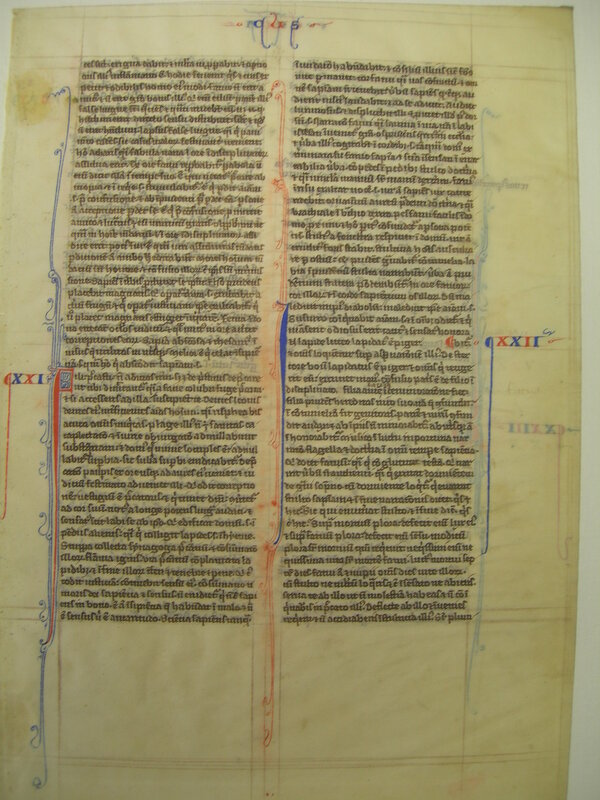 This page from a mid-thirteenth century Oxford Bible measures 20 x 14cm on fine, thin, supple vellum with no yellowing. The leaf is lined in brown ink, and the text is written in brown ink in an angular gothic script. There is no illumination, but initials are flourished, and book name and chapter numbers are also done in red and blue. 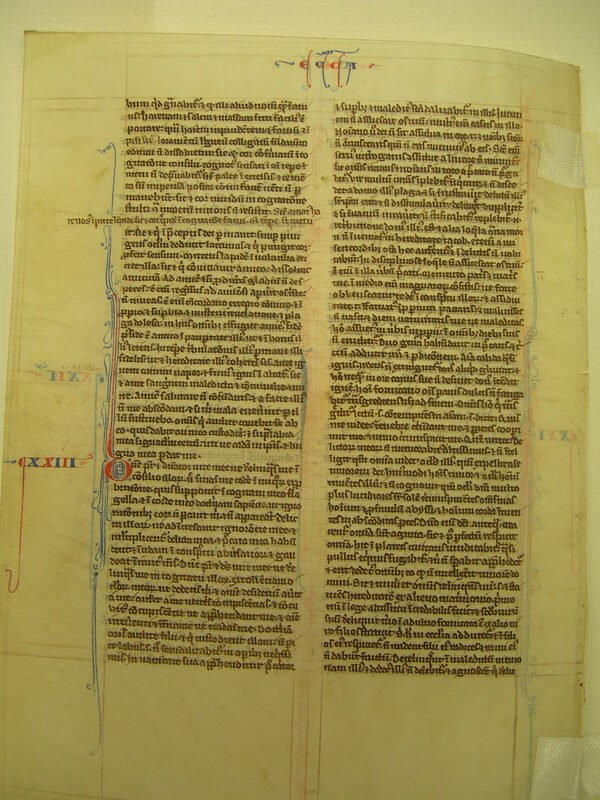 See Denison University Leaf 13 for more information about this manuscript. Text: Ecclesiastes 20:14-22:17 (recto) and 22:17-23:37 (verso). ...for his eyes are sevenfold. 15 He will give a few things, and upbraid much: and the opening of his mouth is the kindling of a fire. 16 To day a man lendeth, and to morrow he asketh it again: such a man as this is hateful. 17 A fool shall have no friend, and there shall be no thanks for his good deeds. 18 For they that eat his bread, are of a false tongue. How often, and how many will laugh him to scorn! 19 For he doth not distribute with right understanding that which was to be had: in like manner also that which was not to be had. 20 The slipping of a false tongue is as one that falleth on the pavement: so the fall of the wicked shall come speedily. 21 A man without grace is as a vain fable, it shall be continually in the mouth of the unwise. 22 A parable coming out, of a fool's mouth shall be rejected: for he doth not speak it in due season. 23 There is that is hindered from sinning through want, and in his rest he shall be pricked. 24 There is that will destroy his own soul through shamefacedness, and by occasion of an unwise person he will destroy it: and by respect of person he will destroy himself. 25 There is that for bashfulness promiseth to his friend, and maketh him his enemy for nothing. 26 A lie is a foul blot in a man, and yet it will be continually in the mouth of men without discipline. 27 A thief is better than a man that is always lying: but both of them shall inherit destruction. 28 The manners of lying men are without honour: and their confusion is with them without ceasing. 29 A wise man shall advance himself with his words, and a prudent man shall please the great ones. 30 He that tilleth his land shall make a high heap of corn: and he that worketh justice shall be exalted: and he that pleaseth great men shall escape iniquity. 31 Presents and gifts blind the eyes of judges, and make them dumb in the mouth, so that they cannot correct. 32 Wisdom that is hid, and treasure that is not seen: what profit is there in them both? 33 Better is he that hideth his folly, than the man that hideth his wisdom. 1 My son, hast thou sinned? do so no more: but for thy former sins also pray that they may be forgiven thee. 2 Flee from sins as from the face of a serpent: for if thou comest near them, they will take hold of thee. 3 The teeth thereof are the teeth of a lion, killing the souls of men. 4 All iniquity is like a two-edged sword, there is no remedy for the wound thereof. 5 Injuries and wrongs will waste riches: and the house that is very rich shall be brought to nothing by pride: so the substance of the proud shall be rooted out. 6 The prayer out of the mouth of the poor shall reach the ears of God, and judgment shall come for him speedily. 7 He that hateth to be reproved walketh in the trace of a sinner: and he that feareth God will turn to his own heart. 8 He that is mighty by a bold tongue is known afar off, but a wise man knoweth to slip by him. 9 He that buildeth his house at other men's charges, is as he that gathereth himself stones to build in the winter. 10 The congregation of sinners is like tow heaped together, and the end of them is a flame of fire. 11 The way of sinners is made plain with stones, and in their end is hell, and darkness, and pains. 12 He that keepeth justice shall get the understanding thereof. 13 The perfection of the fear of God is wisdom and understanding. 14 He that is not wise in good, will not be taught. 15 But there is a wisdom that aboundeth in evil: and there is no understanding where there is bitterness. 16 The knowledge of a wise man shall abound like a flood, and his counsel continueth like a fountain of life. 17 The heart of a fool is like a broken vessel, and no wisdom at all shall it hold. 18 A man of sense will praise every wise word he shall hear, and will apply it to himself: the luxurious man hath heard it, and it shall displease him, and he will cast it behind his back. 19 The talking of a fool is like a burden in the way: but in the lips of the wise, grace shall be found. 20 The mouth of the prudent is sought after in the church, and they will think upon his words in their hearts. 21 As a house that is destroyed, so is wisdom to a fool: and the knowledge of the unwise is as words without sense. 22 Doctrine to a fool is as fetters on the feet, and like manacles on the right hand. 23 A fool lifteth up his voice in laughter: but a wise man will scarce laugh low to himself. 24 Learning to the prudent is as an ornament of gold, and like a bracelet upon his right arm. 25 The foot of a fool is soon in his neighbour's house: but a man of experience will be abashed at the person of the mighty. 26 A fool will peep through the window into the house: but he that is well taught will stand without. 27 It is the folly of a man to hearken at the door: and a wise man will be grieved with the disgrace. 28 The lips of the unwise will be telling foolish things but the words of the wise shall be weighed in a balance. 29 The heart of fools is in their mouth: and the mouth of wise men is in their heart. 30 While the ungodly curseth the devil, he curseth his own soul. 31 The talebearer shall defile his own soul, and shall be hated by all: and he that shall abide with him shall be hateful: the silent and wise man shall be honoured. ...than lead? and what other name hath he but fool? 18 Sand and salt, and a mass of iron is easier to bear, than a man without sense, that is both foolish and wicked. 19 A frame of wood bound together in the foundation of a building, shall not be loosed: so neither shall the heart that is established by advised counsel. 20 The thought of him that is wise at all times, shall not be depraved by fear. 21 As pales set in high places, and plasterings made without cost, will not stand against the face of the wind: 22 So also a fearful heart in the imagination of a fool shall not resist against the violence of fear. 23 As a fearful heart in the thought of a fool at all times will not fear, so neither shall he that continueth always in the commandments of God. 24 He that pricketh the eye, bringeth out tears: and he that pricketh the heart, bringeth forth resentment. 25 He that flingeth a stone at birds, shall drive them away: so he that upbraideth his friend, breaketh friendship. 26 Although thou hast drawn a sword at a friend, despair not: for there may be a returning. To a friend, 27 If thou hast opened a sad mouth, fear not, for there may be a reconciliation: except upbraiding, and reproach, and pride, and disclosing of secrets, or a treacherous wound: for in all these cases a friend will flee away. 28 Keep fidelity with a friend in his poverty, that in his prosperity also thou mayst rejoice. 29 In the time of his trouble continue faithful to him, that thou mayst also be heir with him in his inheritance. 30 As the vapour of a chimney, and the smoke of the fire goeth up before the fire: so also injurious words, and reproaches, and threats, before blood. 31 I will not be ashamed to salute a friend, neither will I hide myself from his face: and if any evil happen to me by him, I will bear it. 32 But every one that shall hear it, will beware of him. 33 Who will set a guard before my mouth, and a sure seal upon my lips, that I fall not by them, and that my tongue destroy me not?